Case: 44 mm, stainless steel, solid screw down case back, screw down push buttons and crown, red rotating bezel, No. 544/2000 Dial: Black, luminous indexes and hands, date aperture at three, red trimmed sub dials for the seconds, thirty minute and twelve hour registers, red center seconds Movement: Val. 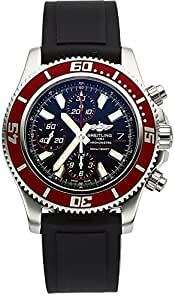 7750, automatic, rhodium finish, monometallic balance, shock absorber Band: Rubber, uncut full length, steel deployant clasp Signed: Breitling on case, dial, movement, buckle. Buy with confidence knowing each timepiece goes through the same rigorous 31-point inspection. Rest assured only authentic parts straight from the manufacturer are used. The Certified Pre-Owned Program on Amazon ensures peace of mind and transparency via standardized reports and a 1 Year Warranty Provided by WatchFacts.